William Edmund Ramsay, born the son of Scottish immigrants in Quebec in 1855, made his fortune in the lumber business in Saginaw, Michigan, and Lake Charles, Louisiana. 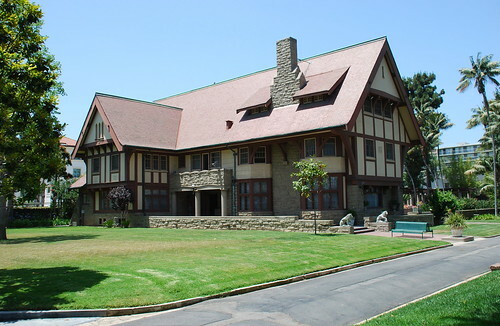 In 1906, Ramsay moved to Los Angeles with his family and bought up three parcels of land between Western Avenue and Adams Place (the latter renamed St Andrews Place in 1914) in West Adams Heights. Included in the mix were more than two and a half acres Ramsay purchased from Mira Hershey. 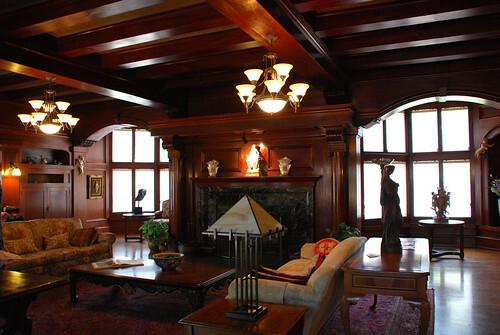 Ramsay then hired architect Frederick L. Roehrig (1857 – 1948) to design this 9,000 square foot, forty-room mansion. 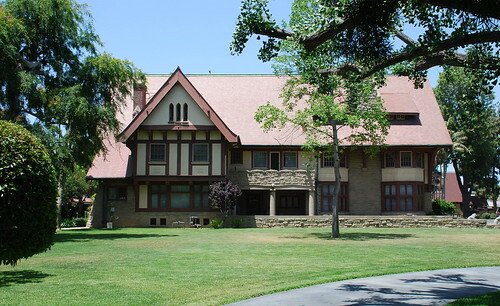 Completed in the summer of 1908, the estate wouldn’t remain Ramsay’s home for long, as he died of “heart trouble” in early February the next year. 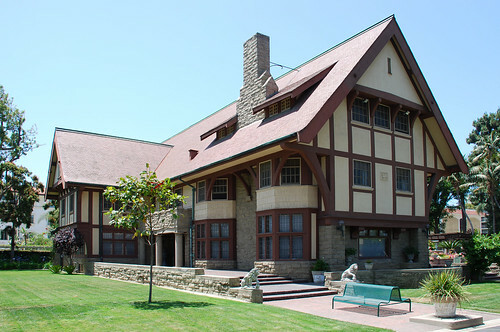 In that summer of ‘08, the L.A. Times wrote of Ramsay’s 225 x 500 foot property, “Probably no more entertaining spot could be found in all Los Angeles on which to build a handsome home.” Roehrig and the building contractors, the Barber-Bradley Construction Co., created for the Ramsays a three-story, Tudor Revival masterpiece made of stone and half timber, plaster finish, and topped with a slate roof. See! 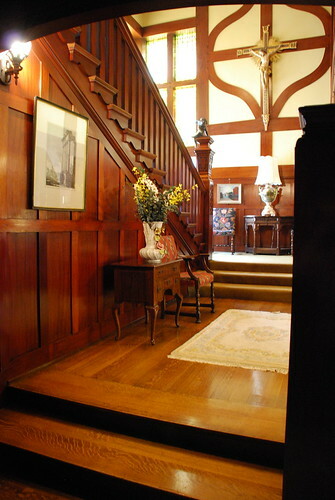 The grand entrance hall, ceiling-beamed and wainscoted in mahogany. Behold! 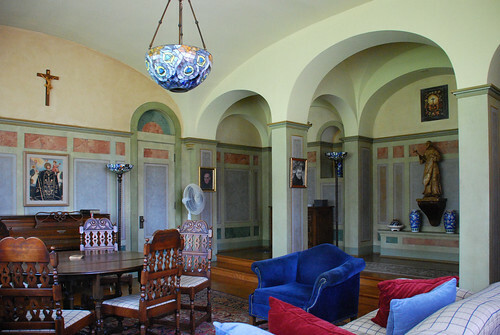 The former living room/library. 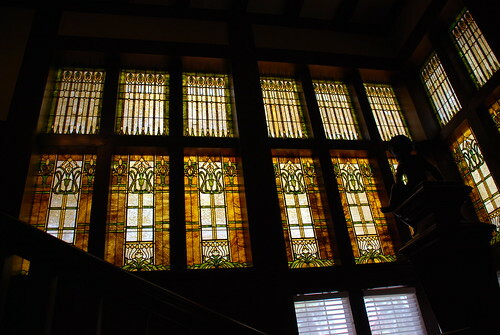 Originally, the room sported electric fixtures made of brass with Tiffany shades. 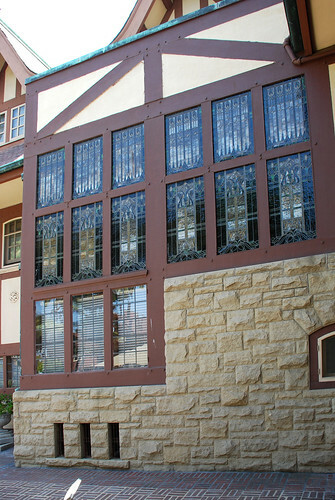 Like with the rest of the first floor, this section of the home featured leaded windows. Witness! 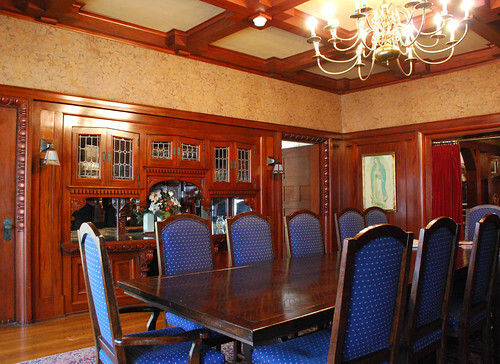 The very splendid dining room, also in mahogany. Art glass, from the inside and out. 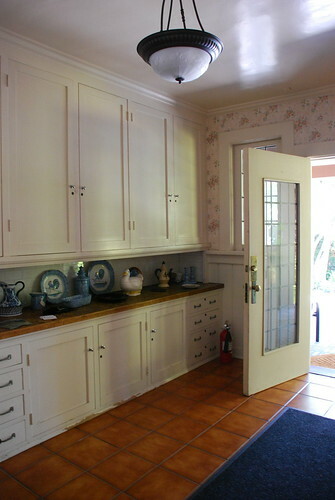 The second floor contained five bedrooms, each finished in white enamel and given its own bathroom. The showcase of the Ramsay’s third floor was a 25 x 90 foot assembly hall/ballroom. That floor also had four bedrooms as part of its servants’ quarters. Going back outside, F.L. 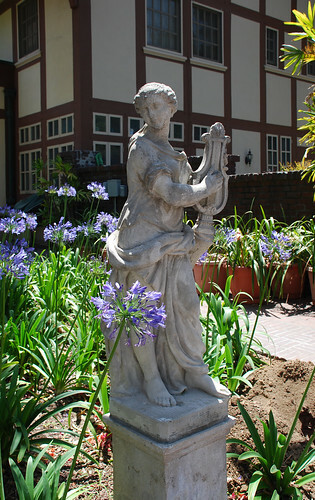 Roehrig was also in charge of the estate’s landscaping. 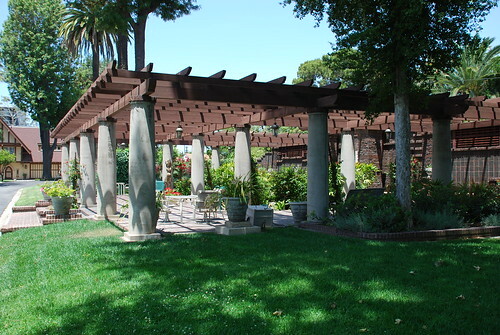 Here’s the old pergola, sans the original lily pond. 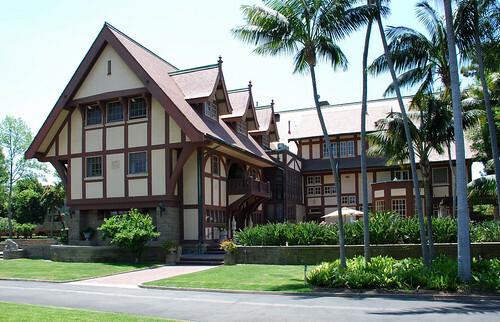 On the lot’s northwest corner stands the two-and-half-story carriage house with chauffeur’s quarters. 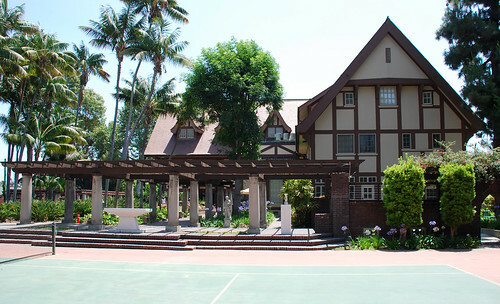 The home originally did have a tennis court, but probably not a basketball court. Back in 2001, historian Cecilia Rasmussen wrote the Ramsay estate – after William’s death – became the site of “lavish parties, quarrels, a shooting and a suicide – of which no details survive.” (Rasmussen claims scenes from a Charlie Chaplin film were shot on the lawn – anyone have any idea which movie?) Ramsay’s widow, Katherine, by the way, passed away in July 1916. Owners #2. William Durfee and Nellie McGaughey were each thirty-two-years old when they met; she was a filthy rich society dame, Durfee was “her mother’s horse trainer, a harness racing driver, a gambler, married and the father of two.” Soon after Nellie’s mom died in 1911, the couple wed, living in the South Figueroa Street mansion that had been the home of Nellie’s mother and her husband, banker Nicola Bonfilio. 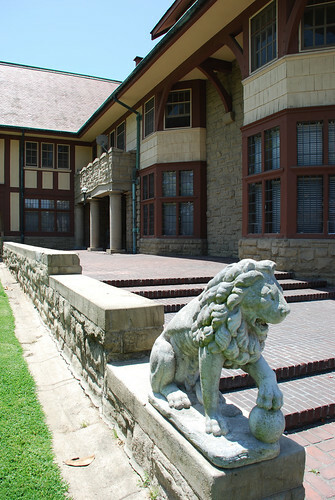 In 1924, a year after Bonfilio’s death, the Durfees bought the Ramsay estate for $105,000. 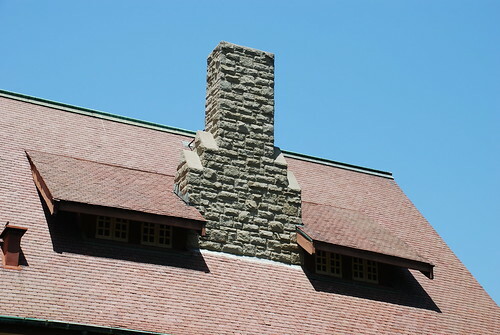 The north (top) and west facades. Unfortunately, William Durfee died three years later after eating some poisoned fish on a trip to the Columbia River. Nellie didn’t take Durfee’s demise all that well, giving a go at suicide on a few occasions. While none of those attempts was successful, the poor woman grew to be an eccentric kook who, among other things, preserved her home in a museum-like fashion as kind of a shrine to her late husband – you know, keeping his clothes in his closet, his booze in the wine cellar, and the key to his bedroom around her neck. This lasted until she finally passed away in February 1976, a few months short of turning 100. Owners #3. 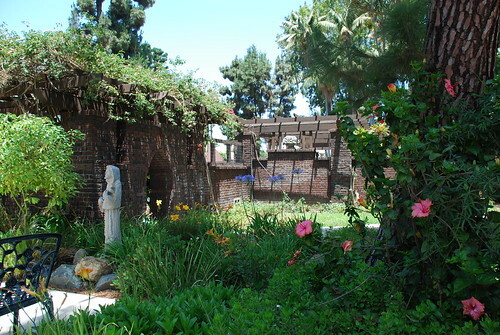 In the spring of 1978, the Brothers of St John of God, who, in the 1960s, demolished a turn-of-the-century mansion next door to the Ramsay-Durfee estate to make room for their nursing hospital, bought the seventy-year-old mansion for $470,000. 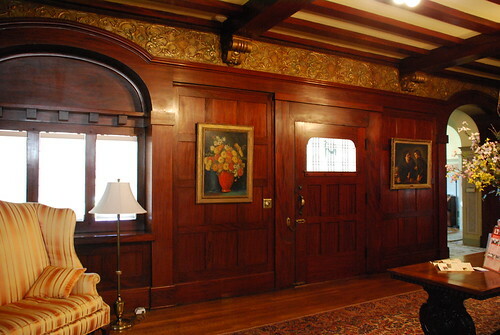 The Brothers auctioned off much of the original furniture, fixtures, and Nellie’s seventy oriental rugs. I should point out the Brothers have apparently been excellent stewards of the property. 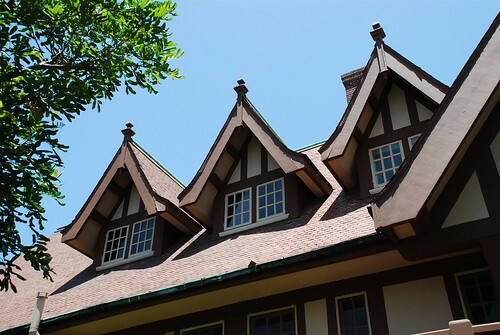 It was during their ownership the mansion was declared a Historic-Cultural Landmark as Villa Maria, and they were gracious to open up the house as part of a neighborhood tour put on by the West Adams Heritage Association last June. That’s when these pictures were taken. The way in and out toward Western Avenue. 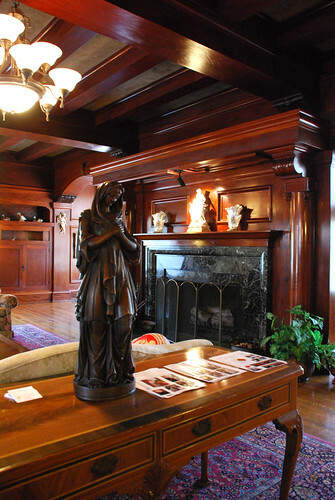 In addition to the aforementioned, unidentified Chaplin film, the Villa Maria has been the location for a few movies, including True Confessions and Sister Act II: Back in the Habit. See! Behold! Witness! Observe! thanks to you I did. What a fantastic and sad story..a spin on the theme of the heiress running off with the stable boy. 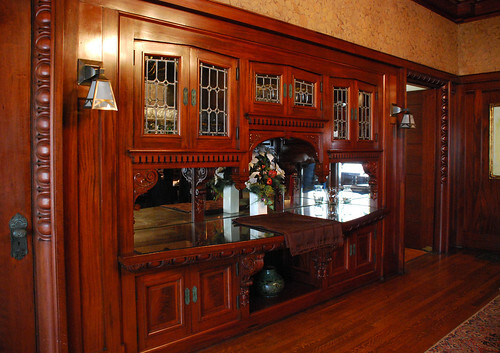 Did I mention the woodwork, glorious! Holy tapioca, what a bee-you-ti-full place, woodwork to die for. Thanks for the great post and photos. My grandmother (a lifelong resident of New Orleans) was a friend of Marjorie Ramsay--among her papers is a small address book ca. 1910-11 when she was at Briarcliff College (Briarcliff Manor NY) possibly with Ramsay. Anyway, Ramsay's name is in the little book followed by "2425 Western Ave, Los Angeles, Cal." The Ramsays had Louisiana connections. No idea whatever happened to M Ramsay and I can't say I remember hearing about any sordid Ramsay stories, darnit. Thanks, Anonymous. Could Marjorie have been Margaret? Ramsay's obituary in the L.A. Times says he left along with his wife four kids: Katherine; Margaret; Hartley H.; and Louis P. Of course, the paper spelled Ramsay as Ramsey, so you never know. I wonder if anyone knows of what debauchery went on? Great post! Does anybody have any idea what species of palm that is planted in the yard? The interior woodwork looks incredible! The Brothers of St. John of God appear to have been fine stewards of the property. Hats off to the great pictures, too. Here's a link for more info and a photo of Ramsay. Thanks, Hilltopper. 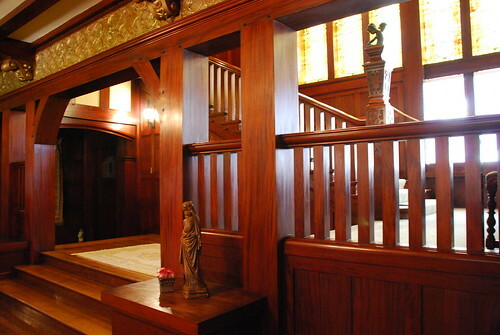 The woodwork is beautiful and in great shape. (Oh, that link was the first in the post). Dang, that's a fine-looking house. And nice to see it's in swell condition, I look forward to touring it myself someday. In answer to Steven who asked about the palms -- those are Forsteriana, one of the first imported to the US ca. 1860. 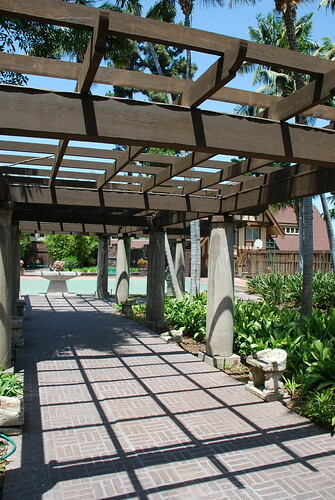 Often cultivated as an indoor palm that you'll see everywhere, in fact everything you see indoors is a Howea. Common name is the "Kentia." Another fascinating post, Floyd. Thank you! Floyd, are you taking a vacation? We need more Old LA! Glad to hear you're fine. Take it easy. I wouldn't mind a few months of not doing anything myself! Floyd! You're back. Good thing. There are so many more landmarks to go! I came do to my catch up on the post and i didn't see any. Please tell me you haven't stop doing updated. I live in Michigan but I really enjoy reading your post. Please post more soon. Floyd, your fans miss you! I really enjoy reading this blog. I recently moved to Echo Park after sojourns in New Orleans and Charleston(SC), cities where architectural history and historic preservation are part of the public discourse. Big Orange Landmarks is a treasure chest of hard-to-find information and insight. I sure hope that Mr. Bariscale resumes the good work. 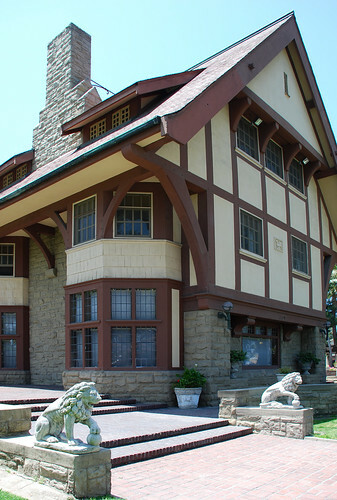 I imagine you're just waiting for these historic buildings to gather a little more history. --An OC expat on the East Coast. Hello Floyd. 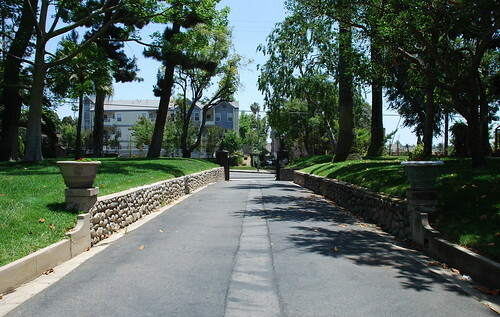 I was wondering if Gen. James Longstreet's palm trees in West Adams are on the official list of L.A. Landmarks. If not, I think you'll agree they should be! Flyod, you departure and the silence that follows draws the sad sighs of those of us who - throughno fault of our own - find ourselves in New York instead of Los Angeles (city of our birth and our hearts). .Should you ever wish to return, know that we shall weep with joy. .If you want to know about the life of an ex-pat here, view www.nincompoopery.com . I am not as entertaining and instructive as yourself, but I will willingly trade stories - at least those that tell our scattered families how we are. Sad puppy eyes, Belle Jolie! Actually, like I've told folks in emails, the blog was feeling more and more like homework, and the time off has been great to catch up on other things. Hopefully, I'll pick it up again. Thanks to everyone with notes of encouragement. Funny you should use the term homework. Thats exactly what I used when I did a small post on the LAX Theme building. Instead of linking Paul Williams to Wikapedia, I linked him to one of your posts saying "he's done all the homework for you". Please come back! Don't be afraid of No. 231. I can't even find a picture of El Greco.. I can't even find Haywood Street. HAY-ALP! Oh how I wish you were back and I don't even live in LA. I look forward to a surprise of stopping by and seeing a new post. We're now past the one year mark. Haven't you made us suffer enough? I must agree. Please put us out of our misery! How I long for the day that I log into my Google reader and see a (1) next to the blog that I have fallen in love with…Big Orange Landmark! I know im not alone! I'm chiming in to request a return! I just found this amazing blog and I'm so sad to see it's dormant! I've been inspired to volunteer for the LA Conservancy. Maybe you should assign each of your loyal readers a landmark for us to research and bring to your blog!! I for one would be willing to pitch in! Thanks for all the prodding, everyone. I'm working on another set of posts, though I've forgotten a few research essentials, like how to get to the library. In any event, I'm shooting for new entries for sometime in July. Keep me to my word, please. That's great to hear, Floyd. It's been a full year. I've been "Anonoymous" here before... had almost given up hope for more of your brilliant blog, and your wit... and today I look in... and find that you're alive, Floyd, not only alive but planning a comeback. But we won't call it that. I hate that word. It's a return, a return to the millions of people who have [almost] never forgiven you for deserting Big Orange Landmarks. Floyd! We wait with great anticipation. All the love to you, cousin! Very much looking forward to new posts! I just know one of these times that I come by for a visit, "No. 230 - Villa Maria" will have moved down a notch or two, and then I will shout with joy. Floyd, I'm thrilled to hear you are working on new posts! I've followed your blog for a long time and I absolutely love reading about the historical landmarks. I have missed reading your blog over the last year (I re-read old posts when going through withdrawls!). Your work is very much appreciated and enjoyed and I can't wait to see what you write in the future! Go Floyd! Let us know if any of us can help you in any way. Reference your post in June--not a lot of time left! WOW! Thanks for posting this! 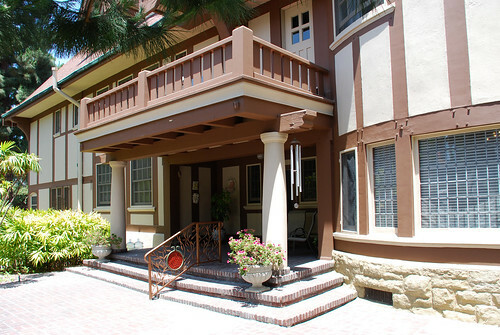 I live in LA in the historic mid wilshire district/Hancock Park area (and love my deco apt. building), not too far from that area. NEVER knew that was there! 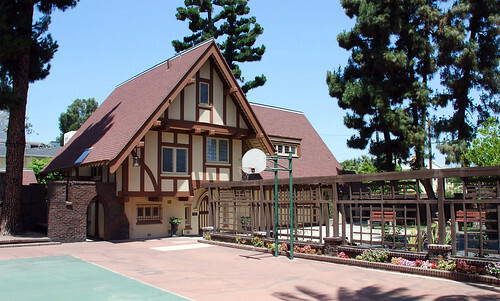 I actually went to 24th Street Elementary School (just behind it) when I first moved to LA in the early 70's, so the old dame was still living there when I went to the school there! I've driven by there a gazillion times and never knew the history (nor seen the entrance) Neat! Good thing that it sits way back from the street because just below Adams Bl., it gets pretty sketchy!! Hooray for LA's beautiful history still being alive and well! So when you comin' back, Red Ryder? I hope someone takes this over and continues it. Please come back to your site! I love this site and have come across it a couple of times in internet searches. 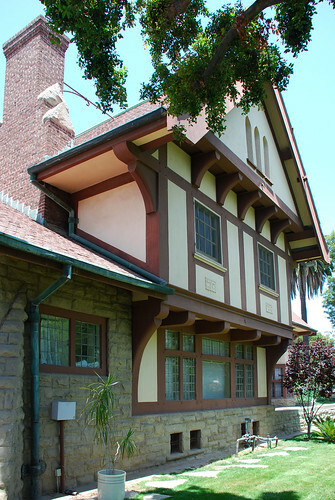 I live in the Los Angeles area (Toluca Lake) and I love learning about the history of buildings and houses in this city. Please post again!!! I lived in the Chaffeurs house from 1914,with my parents and brother, married in 1940 and closed the house in 1986 when my widowed Mother deceased.THe Durfees were wonderful to our family.My life there was a fairytale. Thank you for the great pictures. ITs home to me!If only my husband could have afforded the water bill, I'd be there now! Want to hear more? "My Chauffuer" was filmed here in 1985. Actress Clara Kimball Young is listed here in the 1920 federal census; it appears that her father, Edward M Kimball, was renting the house at that time.